With just three games left until this year’s top AFL team is decided, new research by Roy Morgan has revealed that despite not having a car sponsor, fans of premiership contenders the GWS Giants are among the most likely of all AFL club supporters to buy a new car soon. 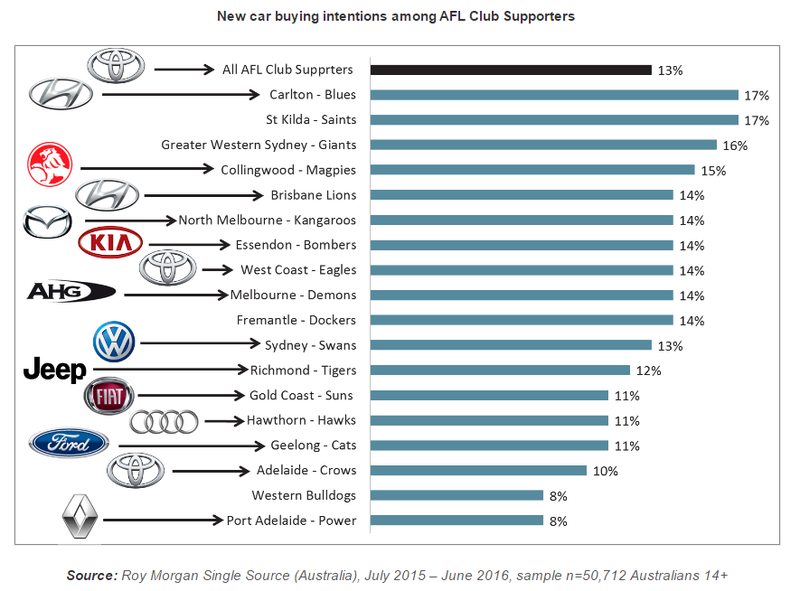 Roy Morgan’s annual look at new car buying intentions among AFL club fans found that 16 per cent of Giants supporters are in the market for a new car, placing the team third in the research giant’s rankings, and second in comparison with other clubs without a car sponsor (the St Kilda Saints was first with 17 per cent). Jordan Parkes, head of automotive at Roy Morgan Research, said Mitsubishi and Land Rover would be a potential good fit for the Giants, with car buyers in Sydney’s west particularly keen on these makes, and because neither of which currently sponsors an AFL team. “Of the major makes, Mitsubishi has the most footy-mad market overall, with 62 per cent of people who intend to buy a new Mitsubishi supporting an AFL team, compared with 45 per cent of all new car buyers,” he said. Aside from the Giants, the Western Bulldogs are the only other team left in the AFL finals race without a car sponsor, with 8 per cent of its fan base in the market for a new car.